As I stepped out of my car to head to class, the frigid wind slapped me in the face and whirled straight through my inadequate jacket. Severe allergy and sinus attacks had just started up again due to the instability of the weather, and I was simultaneously feeling the onerous weight of a piercing headache, heavy congestion, continual fits of sneezing, and a temperature that was certainly not conducive to a leisurely walk to class. As is often the case for me, my physical circumstances began to invade and overtake my mental and spiritual stability. I began to inwardly lament my condition. In my eyes, of course, I was a paragon of suffering; I was walking through the valley of the shadow of death. In other words, I was feeling sorry for myself. These were the fleeting, self-absorbed thoughts that I was thinking. 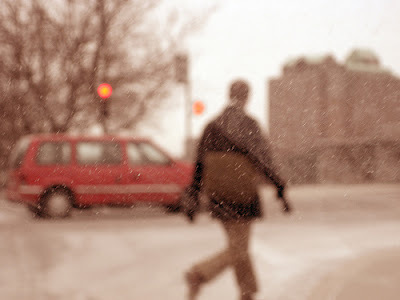 Then, all of a sudden, a chilling gust caught me just as I was crossing the street. Somehow, the wind had craftily snaked its way up from the bottom of my jacket and given me an icy jolt. That's when it happened. All of a sudden, I wasn't crossing the street anymore. I was alone in my college dorm room for the first time reading Jonathan Edwards' Resolutions. At that moment I was reading number 10: Resolved, when I feel pain, to think of the pains of martyrdom, and of hell. Reliving my first encounter with these words stopped me, as it stopped me then. I could not get past the profundity of this thought. What a worldview this must be. How can an individual be that in-tuned to the things of God? These words were seared into my brain that night, and they surfaced forcefully as I hurried across the street. I began to think about the Clariton that I had taken before I left my warm house and got into my working vehicle. I thought about the coat and the clothes that kept me from really freezing. Immediately my mind made the connection to martyrs and believers all around the world that had died in frigid temperatures much worse than the ones I was facing, forced into this misery because of the faith that they would not give up or recant. I thought of all those who like me had severe sinus problems that endured the worst conditions, without medicine, because they would not trade the trifles of this world for the treasure that they had found in Christ. I thought about the torment that unbelievers would experience in a hellish destiny that would involve burning far worse than what my wind chapped face felt. Suddenly, my plight did not seem so bad. Now, the temperature had not changed, nor had my sinus problem been alleviated, but these pains had been transformed by God's grace from an occasion for self-pity into a catalyst for Prayer. The remainder of my walk was spent in intercessory prayer for the persecuted church. Now before you accuse me of self-exalted piety, I completely forgot my new found worldview as I walked back out to my car at the end of the day. I had fallen prey again to the old familiar and comfortable self-absorbed thoughts that seem so alluring at times. It appears that one must fight, or perhaps resolve, to possess a profound and continual God-saturated view of the world. Resolved, that whenever I am slapped by the wintry winds or attacked by extreme allergies, to use this fleeting pain as an occasion for prayer for the persecuted believers and the perishing unbelievers throughout the world.